This book starts up not long, maybe a night, after Cinder finished. We have Scarlet, who is a farm girl from France that is looking for her Grandmother who has been missing for 14 days. Then we have Cinder who is escaping from prison with Thorne, who just happened to be right where Cinder needed to be to escape. We have Wolf, who is a street fighter and has never had a tomato before in his life. Oh and he’s also part of some gang called The Wolves. I guess that’s important too. And finally there is Kai, the new emperor who, on his first day, has to deal with finding Cinder in 3 days before Levana declares war. He is also dealing with his feelings. Did he really feel those things, or did Cinder glamour him to feel that way? We all know the truth. She didn’t know she could, even if she wanted to. 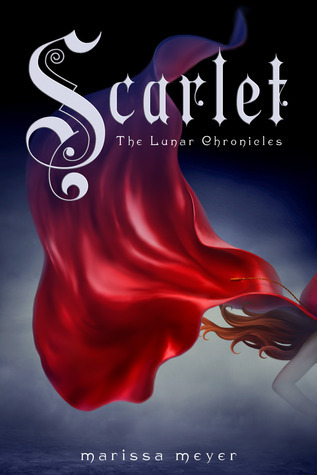 This book focuses on Scarlet trying to find her grandmother. Cinder trying to find Scarlet’s grandmother. And everyone else trying to find Cinder. Funny how things work out, isn’t it? Scarlet’s believes without a doubt that her grandmother was kidnapped and did not just run away, even though that’s what the police say. During the time from when she is kidnapped to when the book starts she has been going through the steps of life while the police “search” for her. She is making a delivery to a popular bar in town when she hears people talking down Cinder, who just happens to be on the news because escaped Lunar Cyborg convict makes worldwide news. Scarlet stands on the bar to defend her, and then punches some guy. This is kind of how she meets Wolf. When she gets back to her house, she sees that a light is on and thinks that it’s her grandmother. It’s not. It’s just her drunk of a dad ransacking the house saying that he needs to find what she(Scarlet’s grandmother) is hiding so they won’t kill him. He doesn’t have much to say, we find out later he was wearing a transmitting chip. But he has burn marks all up his arms. She calms him down and finally gets him to sleep. She does the same. When she wakes up she sees someone in the chicken coop field. It’s Wolf. She runs out aiming a shotgun at him. After a fight with her dad that ended with Scarlet saying she never wants to see him again Wolf agrees to help Scarlet find her grandmother and that she is probably in Paris. So off they go. During all of this Cinder is escaping, walking through a sewer, finding a stolen ship and running from cops. She is also plugging herself into the ship because it is almost dead and it almost kills her in the process. They decide to go to France to look for the person that had Cinder before she went to the Eastern Commonwealth, Michelle Benoit. Scarlet’s grandmother. Some stuff happens on Scarlet and Wolf’s train ride to Paris. All important of course. But they finally get there, and right away Wolf knows that people are watching them, waiting for them. I think I’ll end it there. Everything for here on out is highly important and I don’t want any spoilers. The whole book really is just people escaping. People looking for other people. Some diplomatic stuff thrown in there. Some jumping off of, and onto, trains. Iko is now a spaceship. How great is that? It was a lot of detail for Scarlet and Wolf, who I LOVE together. Ok. They are perfect. Well…not perfect. But I think they are super cute. Most of Cinder’s parts are her trying to come to terms with the fact that sometimes it’s ok to use her Lunar gift, if she is using it for good, and not for the reasons Levana uses them. She is trying to figure out herself. If she wants to do what everyone thinks she can do. This entry was posted in Book Review and tagged book, book review, book reviewer, books, lunar chronicles, marissa meyer, review, reviewer, scarlet, young adult. Bookmark the permalink. Scarlet’s story sounds a lot more intense than Cinder’s. I plan to marathon these books this month. Great review! It is pretty intense. And so far, Cress’ story is pretty intense too. I can’t wait until November.